New Zealand Police believe the Christchurch terrorist attack suspect was on his way to another target when they stopped him, according to Mike Bush, the commissioner of police. What he's saying: "We strongly believe we stopped him on the way to a further attack, so lives were saved," he said Wednesday morning local time. The latest: The first funerals of the attack victims began taking place in Christchurch around lunchtime Wednesday local time. 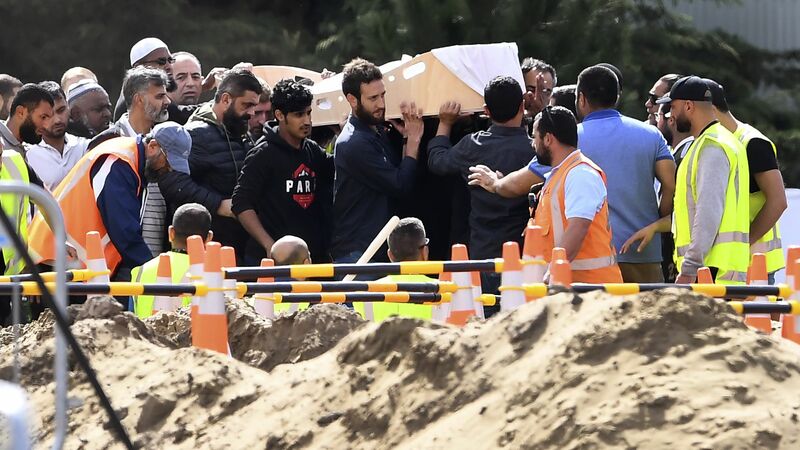 Khalid Mustafa, 44, and his 15-year-old son, Hamza Mustafa, who arrived as refugees from Syria in 2018, were the first to be buried. A total of 6 funerals had taken place by the end of the day. Others are planned for Friday. Post-mortems have been completed on all 50 victims — the remains of 30 were being released to families Wednesday. Canterbury District Health Board said 29 people were still being treated in Christchurch Hospital — 8 were in critical conditions. A girl, 4, was in a critical condition in an Auckland children's hospital and her father remained in a stable condition in another hospital in the North Island city. New Zealand Prime Minister Jacinda Ardern said a 2-minute silence would be held Friday, marking one week since the attacks on two Christchurch mosques. Ardern was welcomed at a local school that lost two students in the attacks with a haka pōhiri — a ceremonial dance.